(Feb. 4, 2019) -- This semester, a new initiative has streamlined event planning across the university. The new process features the use of 25Live and RowdyLink for more effective, transparent communication between event stakeholders. There is now no need to communicate separately with multiple campus partners to plan an event. The new centralized event process includes three steps to receive a confirmed room reservation. First, event planners find room availability in real time using 25Live, hosted by Events Management and Conference Services. The event will be designated an event reference number which is needed for the next step. Second, event planners enter event details into a RowdyLink form, which will be viewed by campus event partners from different areas. The form automatically routes to campus partners to solidify technical and security assistance and monitor for risk management. After receiving a reservation for space, event planners will be able to share details and documents for review and comment by the appropriate offices. The third step is a planning meeting, if necessary, with a space scheduler/event manager to confirm details. Detailed instructions for the new process can be found on the UTSA Events website. Automation of event planning provides benefits to both the event planner and space custodian and streamlines the safe use of facilities in a way that complies with university safety regulations. “Centralization of communication between UTSA event and meeting planners, schedulers of campus spaces, and campus partners via an online platform is a best practice resulting in greater accountability and improved troubleshooting where needed,” said Sam Gonzales, vice president for student affairs. 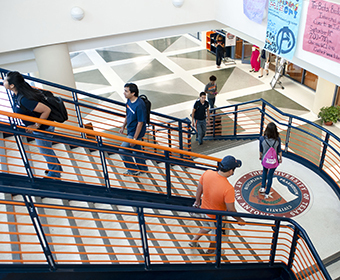 UTSA policies concerning major events are listed in the UTSA Handbook of Operating Procedures 9.50: Major Events Hosted by Non-University Users, developed to maintain the safety of the UTSA community and to further its mission of education, research and public service. University partners are encouraged to provide feedback during this initial semester of implementation at EMCSevents@utsa.edu. The initiative team will regularly review feedback and provide updates on the UTSA Events website.